That is about exactly what I'd expect to see with an HV pump and heavy oil. What are your main a rod bearing clearances? Both are .0015"-.002". What I hear you saying is I probably don't need that heavy of oil? No. You do not even need an HV pump. Another issue is the wear on the gears thrust surface indicating that the gear position on the shaft is greater than 4.038" from the collar of the distributor body. Thanks for the recommendation Bob. The absolute base of my gear is 4.030” from the base of the distributor. That was measured via caliper but even with a drop gage I’m sure it’s under 4.038”. Should I add a bit more clearance on the next one? Is that with the thrust clearance dropped or up against the distributor body? Some blocks due to wear at the distributor install boss measure less than 4.028"
When we build a crate engine I measure that distance just in case. 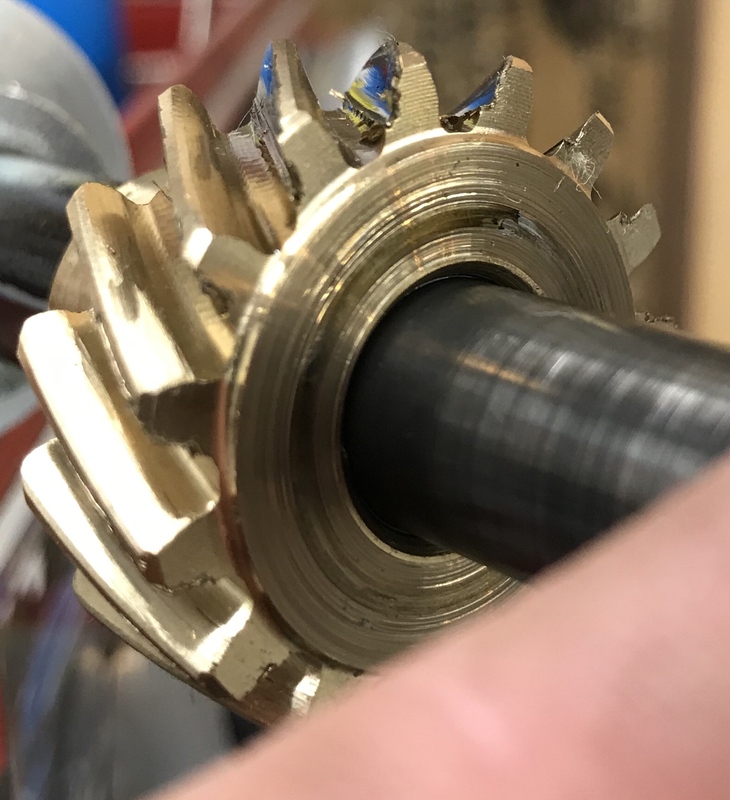 I've had some that were less than 4.020"
We've been using the crane melonized steel gears with good results with the HFD stage 1 oil pumps, tighter clearances, 5 to 10 w 30 oils. 4.030” was with slack removed. It has .030” of clearance so it measured 4.060” with it fully dropped. Block mating surface to cam distributor shaft pilot surface measured 4.040”. So if I brought my next gear up another .020” (to 4.010” with slack removed) I would have zero clearance throughout the entire range of motion. Also another vote against MSD... I’m sensing a trend here. There are many things I don't understand when it comes to distributor gear wear/compatibility. For instance my monster truck customer's wet sump engine. It was built in 2001 and he sold it last year with the same MSD distributor and bronze gear that was run the entire time. It always looked like new and went right back into the engine after a freshening. That engine used a Melling M84DHV pump with the 351C high pressure spring giving over 100psi hot oil pressure with Amsoil 50wt synthetic oil. It ran hundreds of monster truck shows without failure which is a lot of run time, lots of cold starts, very cold weater etc. I just wonder if the MSD bronze gears from that time were much better quality.. In my own experience I have not had great results from a steel gear on a steel core. A few years ago a customer with a Pantera wanted a steel cam with a steel gear in his engine even though it was a hydraulic roller. We used a gear from Mallory and after several hours of dyno run time I pulled the distributor and inspected the gear which looked perfect. He installed the engine in his car and ran it for more than 3500 miles before one day the gear gave up and ate the cam! Doesn't it seem like if it lasted a few hours that it would last practically forever? It didn't. If you look closely at the bottom of the gear and at the wear pattern, you can clearly see that the gear is riding on the block with quite a bit of force. That cannot be. Also if you look at the wear pattern, you are not centered. As the cam turns, it has to enter the gear and exit the gear without being off the gear. With your case, you are exiting off the gear. Also check to see how much back lash you have. If too much, you may need a gear that is slightly larger. Bingo..........morel made them for msd for 35 years..........untill holley was brought out by a overseas company which are now using a lower quality bronze gear from china. So buyer beware!!! I bet that's right. I also wonder about the choice of oil. Are some engine oils fortified with EP additives that could be bad for bronze? With the end play compressed 4.005 - 3.996" is what you need. I always shoot for 4.00". Hitting those numbers will very much improve gear wear. Alright- not criticism, just getting my facts straight, there is plenty of conflicting information here. Lem and Jegs suggest the gear be installed at 3.996-4.005. Ford Racing and MSD (Can't find link to MSD just yet) suggest 4.031-4.038. Based on the measurements I have taken, the 4.000 nominal position will certainly place the gear well above the block. The only problem I see with this is that the thrust generated by the spiral bevel gear mesh will have to be shouldered internally by the distributor, which (in theory) is problematic as my MSD only has ball bearings which aren't designed for a thrust load. I'm not saying it doesn't or hasn't worked, but has this proven to be an issue for anybody? The ~4.030 position places the gear right on the thrust surface of the block, which seems like the better way to shoulder the load, but it sounds like the gear mesh is less than ideal at this location. 04-05-2019 06:50 AM by Ozzie H.